Not ‘when I get around to it”. God often brings opportunities into our lives at just the right time for us to act. He orchestrates situations and opens our eyes to the part he is asking us to play in his plan. And he wants us to do this now. It’s like he is standing in front of us, holding out his hand, asking us to take a part in what he already is doing. 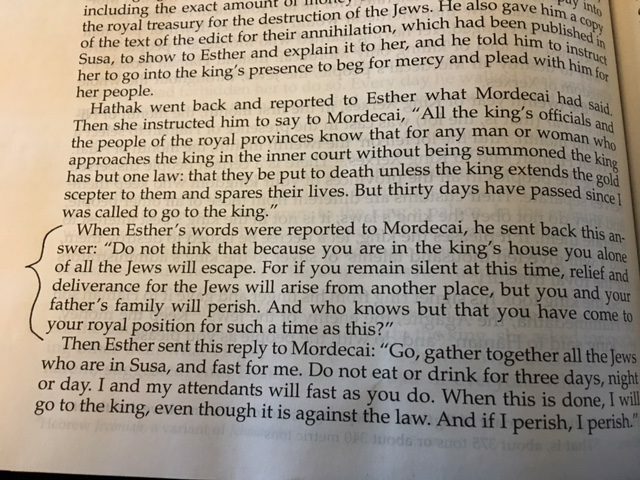 “For such a time as this.” Mordecai told Esther thousands of years ago. She had an opportunity to put her life on the line in order to save her people, the Jews. Mordecai told her he believed God would deliver the Jews with or without her but this was going to be her only chance to be a part of it. This is the reason God made her queen. God holds out his hand to me and to you – giving us an opportunity to be a part of what he wants to accomplish here on earth. We just need to take his hand and let him lead us through it. Queen Esther had time to pray extensively about her opportunity and get her ‘prayer team’ on it. Sometimes we get a chance to pray about it but other times we just need to say a quick prayer of obedience before we step up and act. God is at work all around us. What opportunity has God opened your eyes to lately? He has handed me a big ‘For Such a Time as This’ assignment. Its new. It’s challenging. He has put all the pieces together and now I am moving forward in faith. You’ll be reading more about that very soon :).